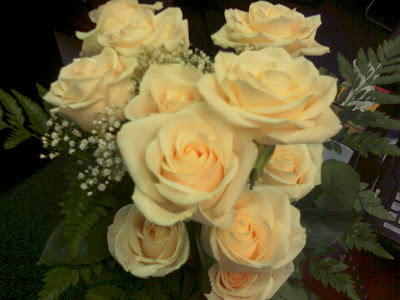 OMG...my husband just stopped by my office to say "hi" and deliver these roses in person! What a pleasant surprise. He left work on a spontaneous whim (he actually thought about this plan last night before bed) to pick up flowers and made the trek to where I work near the Las Vegas strip, just because he was thinking about me (for him, it's not enough to tell me every day how much he loves me). Yeah, he's definitely a keeper! Dom, they were a creamy white in person. Not as yellow as they look in the photo. I took that with my camera on my phone and I don't think I had the white balance adjusted correctly...LOL.